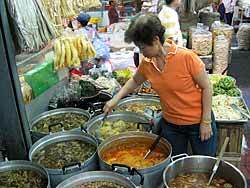 One of our favorite markets, one where Kasma takes her small-group trips is a market street in Bangkok’s Chinatown called Talat Kao (old market). It’s actually a little alley-way, barely more than two blocks long. Kasma and I are market junkies. Although we enjoy visiting Asian markets in the U.S. (see Shopping at Asian Markets (for Thai Ingredients), nothing can beat the markets in Thailand. 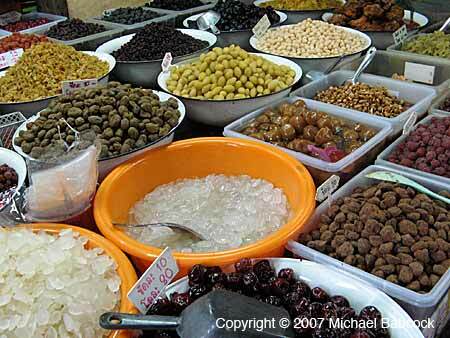 They are colorful, appetizing and the vendors are friendly. 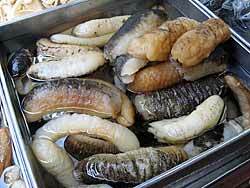 Although you can expect to find many of the same sorts of things for sale at any Thai market, each market does have its own character and certain markets are renowned for a specific item or specialty. Be prepared to be jostled at this market. It’s a very narrow alley-way. At places there is barely room for two people to squeeze past one another, and that’s when there’s no one stopped to make a purchase. Add to this the occasional motor bike making deliveries and it can get very cramped, particularly on holidays. The market is full of fresh seafood of all varieties, including fish, shrimp, prawns, and some things that you might not recognize, such as sea cucumbers. There’s also many vendors with dried foods such as red dates, dried persimmons, dried fish and dried fish stomach. 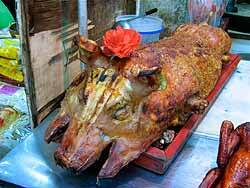 Since it’s a Chinese market, you’ll find succulent roast duck and, on festive occasions, whole roast pigs being delivered. Of course there is also prepared food. One of the great mysteries of Thailand is how, in the presence of so much food everywhere, most of the people remain so slender. There’s everything from the delectable kanom krok (grilled coconut-rice hotcakes) to curries and other Thai or Chinese dishes. 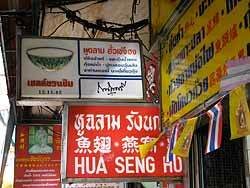 When we go to Chinatown to the market, we always time it so that we can have a meal, be it breakfast or lunch, at Hua Seng Hong restaurant at 371-373 Yaowarat Road. For lunch, we might get duck noodles (make sure you get the wheat noodles, ba mee in Thai) or the grilled duck, succulent and yummy. 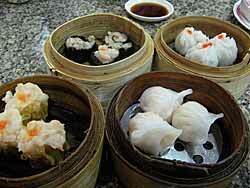 For breakfast, we often get the dim sum, tender bite-sized morsels that are very well-done. In the future, we’ll blog on other markets that we visit regularly. 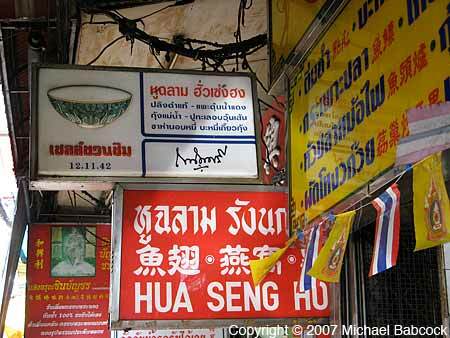 We’ve also posted a number of photographs of Thai markets. This entry was posted on Saturday, July 4th, 2009 at 12:01 am	and is filed under Food, Markets, Travel. You can follow any responses to this entry through the RSS 2.0 feed. You can leave a response, or trackback from your own site. Muay Thai in Lumpinee stadium is also a must if you visit Bangkok. It’s not sure how long Lumpinee stadium is going to be kept before its destroyed so visit it next time you go to Bangkok.